While Frozen Fenway was pushed back an extra day due to a Boston-area storm, the event still proved fruitful for BU. Pegged against the University of Massachusetts Amherst, the Terriers rode through plenty of ups and downs to emerge victorious, 5-3, on Sunday. By the afternoon’s end, four different skaters found the scoresheet, and freshman goaltender Jake Oettinger made 26 saves. The stars of the day, though, were sophomore forward Jakob Forsbacka Karlsson and sophomore defenseman Charlie McAvoy. The former scored twice, giving him five goals in the last two games, while the latter added a tally on the power play. They were by and far BU’s best players against UMass. 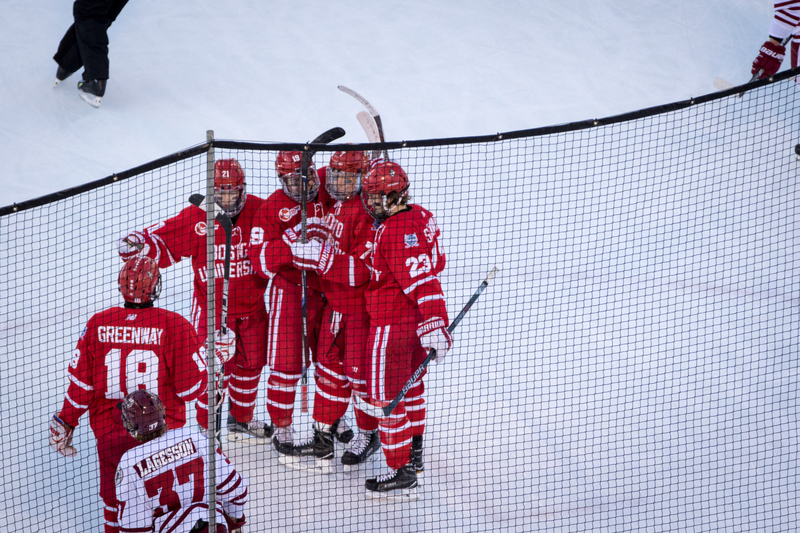 The win pushed BU’s record in Frozen Fenway competition to 2-1, while the squad now is riding a four-game winning streak. Those figures bode well for the Terriers, especially in light of the upcoming home-and-home set against Boston College. Rivalry week is upon us, Terrier fans. BU beat Sacred Heart 7-0 on Friday night at Agganis Arena. Here are videos of postgame remarks from players and the coach.